I want to start out this post by saying that I didn’t sleep very much last night. Noah will be four months old in three days (!) and is still waking very regularly throughout the night. On good nights it’s maybe twice. On nights like last night, however, it’s five. Each time requiring swinging and bouncing that conjure up images from bad 80’s workout videos. Before Noah was born I read the book The Happiest Baby on the Block. The advice in the book has proved to be very helpful, especially the swaddling and white noise. Unfortunately though, my little man has gotten used to being rocked to sleep, only while the person doing the rocking is standing…and it’s getting tiring. My body hurts and so does Rudy’s. It’s time for a change. As with everything in parenting so far, (and with our home-birth), I’ve found that it’s all about taking in as much information as you can and then picking and choosing what works for you and your baby. I can’t subscribe whole heartedly one person’s method of parenting as much as I couldn’t choose just one “Birthing Style”. I’m sure that even if I do get down my own method of parenting with Noah, it will be completely out the window with our next child. So when I mention the names of books or parenting styles, which may have some up in arms, just know that I’m not endorsing one way or another but rather trying to find the right fit for us in this moment. 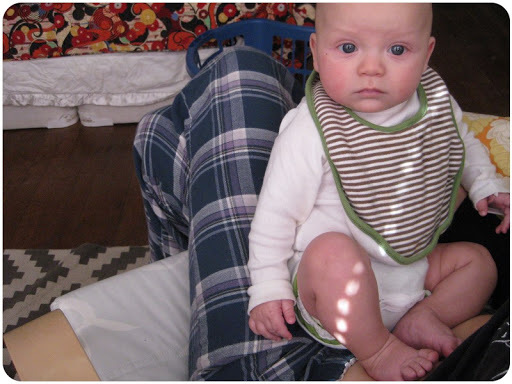 When Noah was tiny and new, attachment parenting was very right for us. I picked him up when he cried and nursed on demand. He has thrived in this environment. He is in the 90th percentile with weight gain and has remained very healthy. The problem is that I really don’t know how often I should be feeding him, and furthermore how much time spent entertaining himself is appropriate. I surely don’t think that he needs to eat every two hours throughout the night, but feed him I do! Foolish mommy, I say to myself, foolish! But when it’s three in the morning and you share walls with two neighbors, (who probably hate us by now), you’ll do anything to keep that baby quiet and sleeping. ..Insert need for schedule here.. When Noah was born, my aunt gave me the book My First 300 Babies. This short text is all about putting your baby on a strict schedule from the start, including wake times spent alone even if baby is crying. Now this goes against all of my gut feelings, but Ms. Hendrick does have a point in saying that this is the only aerobic exercise that a baby will have, and thus will improve sleeping habits. I don’t think, however, that I could endure hearing Noah’s cries for 30 min, let alone an hour and a half. I do think that with or without “alone time”, implementing a daily schedule would really help our whole situation, and now that Noah is older and better at entertaining himself happily it makes complete sense. See? Best of both worlds. Or that’s what we hope for. In conclusion, today I tried letting Noah cry in his crib for five minutes before his usual nap time. And man was he wailing. After those gut wrenching minutes, I picked him up and quietly walked around the room, minus the bouncing etc. He continued to cry for a couple more minutes, even though I was cuddling him close. I really can’t feel badly when I’m nurturing my baby and he continues to cry. I used to go into a frantic state to get him to be quiet, but I don’t think this does either of us any good. After just a few moments of screaming in my arms, he quieted down, and just before he drifted off to sleep I put him down again in his crib. Do you know what happened? He went to sleep. On his own. And has been asleep for two hours. < Previous I’m so tired…and hair inspiration. Next > Because I’m a mom now. You are going to be a wealth of knowledge to me one day. Love you…sooo sooo much.